Let's make your summer hotter! Don't let the heat of the summer stop you for doing what you need to do! Staying healthy and fit requires more than a mindful effort of breathing and stretching. We are with you in this challenging days! So why not put a twist on it? Gladly ladies, the Yoga Challenge is back on its season 3! Come join in any class on the months of August and September 2016 and get a chance to win unlimited prizes! Each classes is counted. After your class claim your card and have it stamped. All out this Summer 2018. Eco Yoga Sanctuary invites all yogis to participate in the Yogis best Asana Instagram Competition Season 3! 1. Send us a photo and a 30s to 1 minute video of your pose to email ID: info@eys.ae. Mention on your email your social media accounts for special mention! 3. The entree with the highest number of likes will win! 4. Winners will be announce on the night of 6th September 2018. Your full body must be captured on your photo and video. Video must be minimum of 30 seconds and maximum of 1 minute with background music. Proper yoga outfit is required. Background must be any Dubai tourist spot. Grand Winner - 1 Year Unlimited Membership worth 7875 AED*! 2nd Place – 6 Months Unlimited Membership worth 4275 AED*! 3rd Place – 3 Months Unlimited Membership worth 2625 AED*! In commemoration of the memory of the late Sheikh Zayed and his contributions, we are celebrating on this day his legacy and virtues. An inspiration in continuing taking care of the welfare of the citizens of UAE and its expatriates. 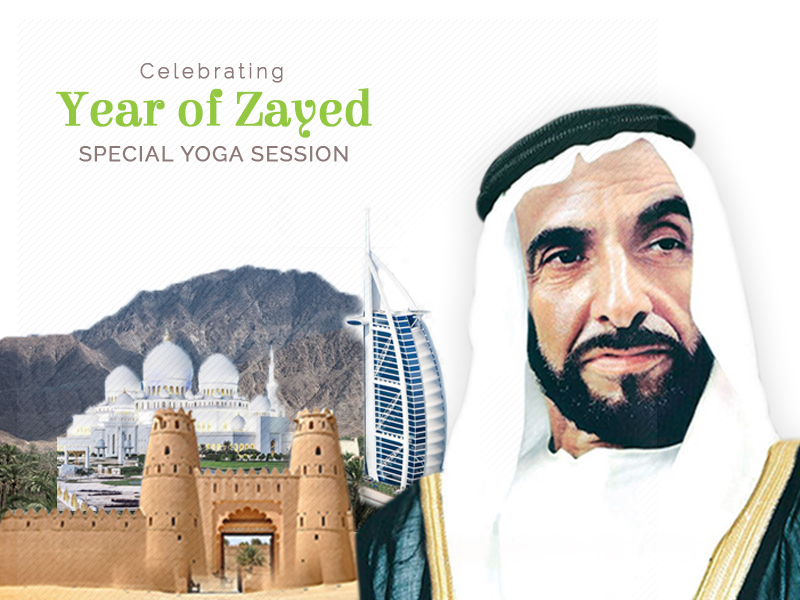 We chose this day to celebrate the Year of Zayed as it holds a significant date. On the same date on the year of 1966 Sheikh Zayed bin Sultan Al Nahyan started to reign as the ruler of Abu Dhabi for 38 long years. On this special day gifts and prizes worth 100,000 AED will be given and more! There's more to that! You can join to any of classes that day for FREE! To reserve your seat please call us on: 04 3856633 - 056 7711336.